paperwork at their summer workplaces, acclimating to their study abroad locales or sleeping in for days on end, the women’s tennis team battled its way to another stellar NCAA Tournament finish, their semifinalist finish a fitting swan song for graduating seniors Paige Hourigan and Johnnise Renaud. The team began its excellent spring semester with a 20-4 mark in match play. That included only one pair of back-to-back losses, to Northwestern on the road and Miami at home in the middle of March. The Jackets only left the Intercollegiate Tennis Association’s top ten rankings once, which occurred during the week of February 18. In April, the women reached as high as No. 2 nationally, only behind conference foe North Carolina. Their performance, including a 12-2 mark in conference play, was good enough to earn the team a No. 2 seed in the ACC Championship. There, the Jackets dispatched the Syracuse Orange 4-2. While Tech star Hourigan couldn’t avenge her loss to Orange stalwart Gabriela Knutson (ranked No. 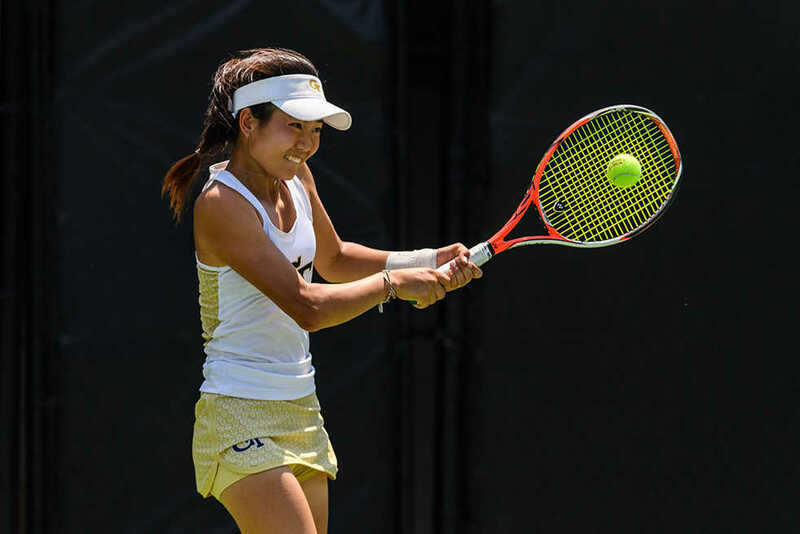 4 in the country in singles at the time of the match), losing another three-set decision, the Jackets were buoyed by a victory over one of the only two ACC teams who had beaten them. The regular season triumphs set the Jackets up in the conference semifinals against national No. 2 North Carolina. The Tar Heels had both the advantage of higher ranking and the comfort of home cooking; the Championship, hosted in Cary, N.C., is situated half an hour from UNC’s campus. But the Jackets had taken the last match between the two, a 4-3 win on the road just over a month before. recent history did not repeat itself this time around. Hourigan, who beat Alle Sanford in the first matchup, was now pit against Makenna Jones and lost in two very competitive sets, the first of which went to tiebreak. That result was decisive, and the Jackets went down 4-3. However, Tech’s regular-season performance was good enough to not only place them in the NCAA Tournament for the 19th straight year, an honor that puts them among the top 64 teams in the country, but also allowed the team to clinch the No. 4 seed, behind only Vanderbilt, North Carolina and Duke. Tech did not drop any of its singles or doubles fixtures in its first two rounds, 4-0 dispatches of Eastern Kentucky and Winthrop. Then came the sort of challenge that makes the NCAA Tournament such a showcase of elite women’s tennis: a matchup against Pepperdine, who had handed the Jackets a loss at the ITA National Team Indoor Championships in Madison, Wisconsin in February. It took a three-set win from freshman Victoria Flores at the end of a grueling four-hour day for the Jackets, but Tech won 4-3. Victory set the team up with a quarterfinals matchup against UCLA. This time, it was Ida Jarlskog’s turn to play hero. After winning the first set of her singles match in tiebreak against the Bruins’ Abi Altick, she dropped the second 0-6. But Jarlskog returned to form in the third set, winning 6-3 and sinking to her knees in celebration as the Jackets punched their tickets to the semifinals. There, Tech was to face the top team in the country: the Vanderbilt Commodores. This time, unfortunately, Tech could not pull off a last-minute miracle. They lost to the Commodores, who in turn lost to shocking No. 15 seed Stanford in the finals. Tech may have fallen short, but they return next season with more experience for their young players and a chip on their shoulder.